The integumentary system is the set of organs that forms the external covering of the body and protects it from many threats such as infection, desiccation, abrasion, chemical assault and radiation damage. IN humans the integumentary system includes the skin – a thickened keratinized epithelium made of multiple layers of cells that is largely impervious to water. It also contains specialized cells that secrete melanin to protect the body from the carcinogenic effects of UV rays and cells that have an immune function. Sweat glands that excrete wastes and regulate body temperature are also part of the integumentary system. Somatosensory receptors and nociceptors are important components of this organ system that serve as warning sensors, allowing the body to move away from noxious stimuli. The skin consists of two layers – the dermis and the epidermis. Together, these two layers form the largest organ in the body, with a surface area of nearly 2 square meters. The epidermis is the outer layer, resting atop the dermis. There is no direct blood supply to the epidermis and therefore, the cells of this stratified squamous tissue obtain nutrients and oxygen through diffusion. This layer also cushions underlying tissues and protects them from desiccation. In hot, dry environments, water is first lost from this layer. Similarly, extended exposure to water during baths or during swimming, crinkles the skin since water is absorbed and retained in the epidermis. The epidermis is made of four layers – the stratum basale, stratum spinosum, stratum granulosum and stratum corneum. In each of these layers, keratinocytes undergo successive steps in differentiation beginning with the proliferative layer in the innermost stratum basale containing keratinocyte stem cells. After division, cells migrate outwards to form a layer of spiny cells called stratum spinosum. The nuclei of these cells are primarily involved in transcribing large amounts of keratin mRNA and other microfibrils that form impermeable cell junctions. The next layer of the epidermis is called stratum granulosum and contains keratinocytes with a granular cytoplasm. This stage in keratinocyte maturation is characterized by the formation of the lipid barrier of the body. The presence of keratohyalin granules is important for crosslinking keratin filaments and dehydrating cells to form tight, interlinked layers of cells that perform the barrier function of skin. The outermost layer is called the stratum corneum and is directly exposed to the external environment. It consists of multiple layers of terminally differentiated keratinocytes that are also called corneocytes. These cells do not have a nucleus and contain copious amounts of keratin filaments. This layer of the epidermis provides mechanical strength and rigidity to the structure of skin. These anucleated cells are resistant to virus attack and are replaced every 15 days, preventing them from becoming a reservoir of infection. 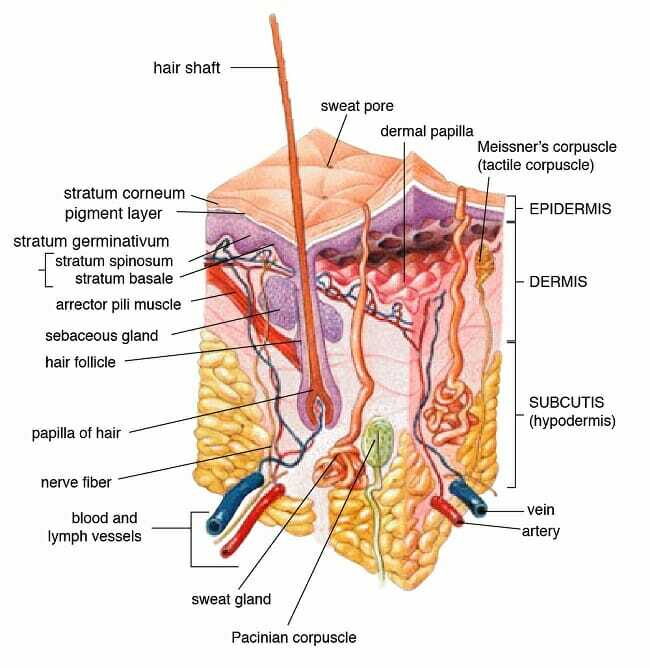 The parts of the skin that have no hair follicles have an extra layer of epithelium called the stratum lucidum that is sandwiched between the stratum granulosum and stratum corneum. This extra layer makes the epithelium of these regions ‘thicker’ than those in other parts of the body. Usually, this is the skin on the palms of the hands and soles of the feet, and in addition to stratum lucidum, is also well supplied with nerve endings. The second major section of the integument is the dermis, and is occasionally called the ‘true skin’ since it is supplied with blood vessels and nerve endings. Sebaceous glands and sweat glands are also present in the dermis. The closest that the dermis gets to the external environment is at structures called dermal papillae. These are finger-like projections into the epidermis and, on the palms, form fingerprints. Sebaceous glands produce sebum – an oily, waxy secretion containing many lipids. The cells forming a sebaceous gland have extremely short lifespans – barely over a week. The soles of the feet are free from sebaceous glands, though the sections of skin between the toes is richly supplied with these structures. Sebum also forms a part of ear wax. These lipids can provide a rich environment for the growth of bacteria, and therefore contribute towards body odor, either when the glands are clogged or when the sebum is not removed periodically. The dermis also plays host to sweat glands. Sweat, in contrast to sebum, is a water-based secretion, containing electrolytes – sodium salts, urea, and even trace amounts of uric acid. While most water soluble waste products are removed in the urine, sweat also contributes towards clearing some of the metabolic byproducts of the body. The presence of many acids, such as lactic acid and acetic acid, makes sweat mildly acidic. A subsection of sweat glands, called apocrine glands, even release proteins, carbohydrates, lipids or steroids. Sweat from these glands, along with sebum, can encourage bacterial growth, and form the site for infection, odor or rashes. Image shows cross section of skin, with various dermal and epidermal layers, glands, nerves and blood vessels. Each layer of the skin contributes to the overall function within the body. The most obvious role of the skin is to protect the body from external aggression. While the skin may seem like a delicate organ, its stupendous role becomes apparent after an injury removes the skin from a region. In fact, preventing infections and regulating body temperature are major challenges in burn victims. Layers of tightly bound, heavily keratinized, anucleated cells provide the first line of defense by forming a physical barrier. The mildly acidic nature of skin secretions also contributes towards preventing pathogenic colonization. Lipids secreted by the skin are another chemical barrier, preventing the loss of water, especially in dry or hot environments. Alternatively, the skin also prevents the body from bloating in an hypotonic environment. Finally, the integumentary system contains resident immune cells that are adept at clearing minor infections. Sweat glands are necessary for thermoregulation, whether it is while working up a sweat during exercise or breaking a fever. Sweat allows the body to cool down. On the other hand, goosebumps arising from the contraction of arrector pili muscles can keep the body warm, especially in hairy mammals. Sweat and sebum also have an excretory role for water and fat soluble metabolites respectively. For instance, excess vitamin B from supplements is removed through urine and sweat. Nerve endings on the skin help in sensing touch, pressure, heat, cold as well as the nature and intensity of damaging stimuli. The skin is also necessary for the production of melanin that prevents damage from UV rays – whether it is a sunburn or skin cancer. Upon exposure to the sun, in addition to melanin production, the skin also synthesizes vitamin D that contributes to bone health and enhances bone density. Diseases of the integumentary system can arise from pathogenic infections, injury due to radiation, chemicals or from genetic disorders. The most common bacterial infection of the skin is probably acne. Technically known as Acne vulgaris, it is usually a side effect of hyperactive sebaceous glands. This is particularly true during puberty, when the pores and glands of the skin can get clogged, leading to bacterial growth and infection. Some of these can be a part of the normal flora of healthy skin, while others, like Staphylococci can piggyback on an existing infection. While acne only causes mild discomfort, at the other end of the spectrum are diseases like necrotizing fasciitis, which can be deadly even with appropriate treatment. Fungal infections of the skin are common especially in those regions where sweat and sebum collect for long periods of time, providing a rich environment for the growth of fungi. These could be along the waistband of trousers, the elastic regions in tight dresses or underclothes, and regions between the toes, when covered by unwashed socks or damp shoes. Fungal infections include athletes foot, yeast infections and ringworm infections. They are usually seen with ring-shaped or scaly rashes, redness, itching, blisters or with the thickening of skin. Dandruff is considered as both a bacterial and fungal infection of the scalp. One of the most common viral infections is herpes. Herpes can spread through direct contact with body fluids. There are usually periods of remission, though even asymptomatic patients can transmit the virus. ‘Cold sores’ arise from oral herpes, forming blisters around the mouth. The skin can also be subjected to genetic disorders like psoriasis or albinism. Psoriasis is an autoimmune disorder and albinism arises from a complete lack of pigments on the skin. Finally, prolonged exposure to UV rays can result in sunburns or even skin cancer, especially in people with low melanin content in their skin. Rhinoceros horns are made entirely of keratin, while most animal horns have a bony core. Calcium deposits in the core make the horn strong. Surprisingly, the term ‘keratin’ itself arises from the Greek word for ‘horn’. Skin that has no hair is called glabrous skin. This is the skin that becomes crinkled when you spend too much time in the swimming pool. Goosebumps are caused by the contraction of small muscles called arrector pili. Heavy metals like mercury, arsenic and cadmium can accumulate in the hair and nails. Having a large amount of Vitamin A supplements can turn your skin yellow or even orange. Acid Mantle – Thin, viscous film that has a pH about 5.0 which rests on top of the epidermis. Thought to have a protective effect against pathogenic attack on skin. Keratin Filaments – Fibrous structural proteins made of long filamentous chains of amino acids that are extensively cross-linked through disulfide bridges and therefore resistant to denaturation. Nociceptor – Sensory nerve cell that detects potentially damaging stimuli and mediates the perception of pain. Sebaceous Glands – Small glands that secrete sebum that maintains the water barrier in skin. It prevents dehydration through loss of water and lubricates the skin through oils. 1. Where is keratohyalin found? C is correct. Stratum granulosum contains keratohyalin granules. These granules play an important role in keratinocyte maturation, dehydrating the cell and mediating the formation of tight intercellular interactions. 2. If the pH of a person’s skin is 5.0 and their soap has a pH of 8.0, what is the difference in proportion of hydrogen ions between skin and soap? D is correct. pH, short for ‘potential of hydrogen’, is an inverse logarithmic scale. This means that between a pH of 1.0 and 2.0, there are 10 X fewer hydrogen ions at pH 2.0. Similarly, at a pH of 3.0, there are 10 X fewer hydrogen ions than at pH 2.0 and 100 X fewer hydrogen ions than at a pH of 1.0. Thus, skin at a pH of 5.0 has 1000 times more hydrogen ions than the soap. 3. Why do athletes and people in tropical climates often have white deposits on their clothes? B is correct. While dust and pollution can contribute, consistent white deposits after sweating, either due to the ambient temperature or due to exercise, arise from the electrolytes in sweat. Sebum, on the other hand, does not result in white deposits. It leaves clothes oily, and attracts dirt and grime.